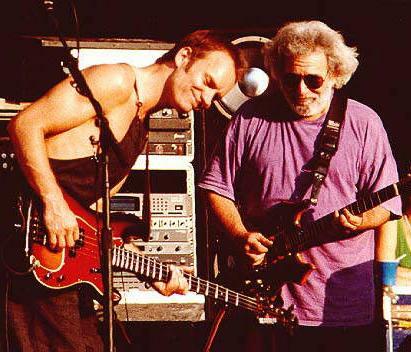 With Sting, who the Dead picked to open some shows in 1993. Garcia sat in w/ Sting's band for a few songs. And, well. here's Jerry when he was a young man. Backstage at the Ark in Boston, April 1969. (and by the way, the three nights the Dead played at the tiny Ark club--April 21-23-- are some of the most raucous they ever played. They proved they could dish back the Boston attitude. Don't let that acoustic fool you).